Actualization: The patient of Alicante (Spain) is negative in Ebola Test. The medical analysis prove than the nigerian patient is free of Ebola. First case of Ebola in Spain? One patient forced the hospital tocactivate the security protocol in Alicante, near Benidorm. A Hospital of Alicante attends a possible case of Ebola NOT YET CONFIRMED. Given the characteristics of the case: Nigerian, has not been yet been 15 days in the country and he appears to have two symptoms of Ebola (apparently high fever and sore throat). The patient, a young Nigerian, went to the General Hospital of Alicante and from there was moved to the Hospital of San Juan, a few kilometres away from the first hospital. The patient was admitted in hospital with his sister, who didn’t suffer any symptoms. 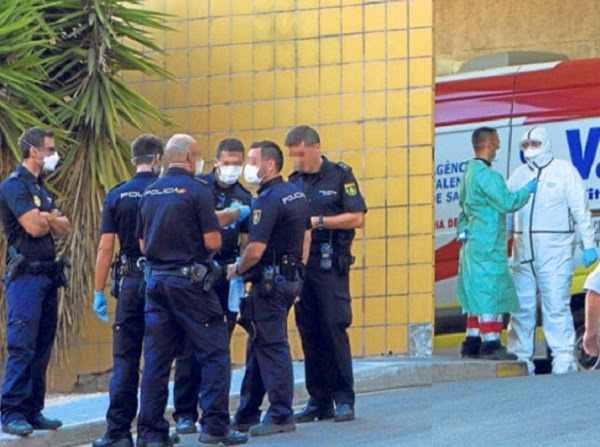 The move from the General Hospital of Alicante to the Hospital of San Juan required two ambulances, police and medical staff with masks and special isolation suits in order not to get infected. The government has insulated an entire floor in the hospital and everything appears to be under control. First case of Ebola in Spain? Recently the spanish coast has suffered a great flood of boats with African people attempting to enter illegally in Spain. This has started a debate about whether or not, beacuse of this, Spain was more exposed than any other European country to the Ebola virus. We could be looking at the first case of Ebola in Spain. It takes place at a time when the emergency services are overwhelmed due to the large influx of tourists and general hospitals attend patients with less resources than normal. The case of Alicante, has however quickly launched the required protocol. In any case, everyone asks themselves the same question, what is going to happen to those who have been in contact with the potential Ebola sufferer, and probably aren’t even aware of it? The medical team has enabled this Saturday the Ebola contention protocol. This happens with a patient presenting several symptoms of Ebola, although they have not specified what kinds of symptoms, other than fever (38.5) and apparently sore throat and malaise. The patient went to the emergency room of the General Hospital (the largest hospital of the city of Alicante) with fever. Doctors of the health center decided to move the patient to another center nearby, the Hospital of San Juan of Alicante. Apparently the reason is because the Hospital of San Juan is the center in the province of Alicante chosen to treat suspected cases of Ebola in the area. The move was done with the help of: two ambulances, medical staff with the required equipment and six police vans. The policemen were also wearing masks. The young Nigerian patient was accompanied by his sister and although she had no symptoms, hospital protocol requires the retention of the person who has been in contact with the virus, at least until the hospital confirms that the Nigerian patient does not suffer the illness. The medical staff has taken every precaution possible and has established the protocol with the intention of protecting the province of Alicante, obviously, they have not stopped wearing suits and masks because this is essential in order for them not to get infected. Apparently it has caused some confusion. The Nigerian patient was well cross and he argued and refused to be moved, according to information provided by ABC. The patient was admitted to the Hospital of San Juan at around seven in the evening. It is in this center where the Ebola practice tests to detect if you have the disease can take place. The Hospital of San Juan have been sending samples of blood and fluids to the National Institute of Epidemiology, Carlos III of Madrid where they are being analyzed to see if the patient shows positive test Ebola. It is important to emphasize that the case is still unconfirmed.